In the contemporary Rolex lineup, there is only a tiny handful of watches measuring 34mm. What was once a fairly typical size, even bordering on the larger side in the post-war era, is now considered particularly small for a man’s watch in the modern age. 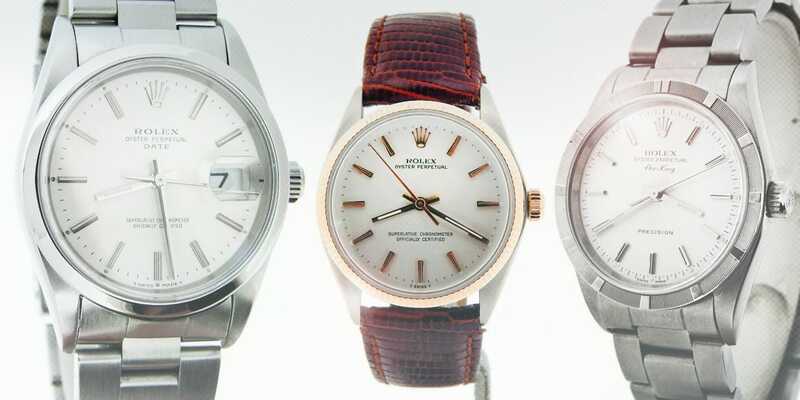 However, the vintage archives are chock full of 34mm beauties; fascinating pieces which, thanks to Rolex’s peerless design prowess, make them still relevant and extremely wearable even today. As the race for building ever larger watches shows the first faintest whiff of settling down, with this year’s Baselworld showcasing a number of models that have taken a slight step back size-wise, these smaller and historically significant pieces could well be in for a renaissance. 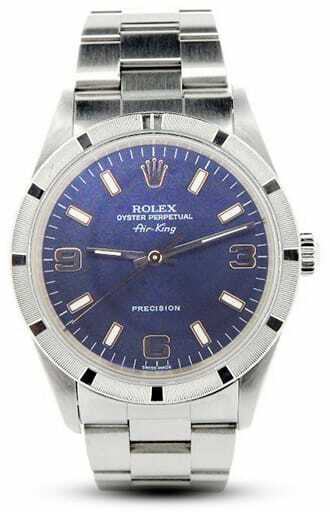 At Beckertime, we have a wide selection of 34mm Rolex watches. Below we’ll take a look at some of our favorites. 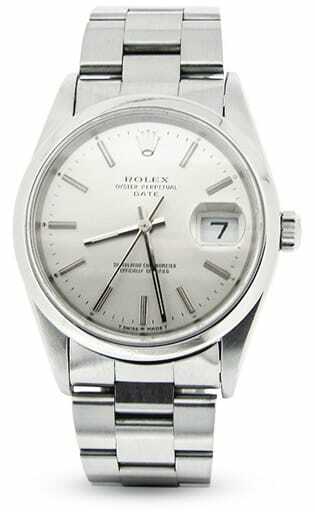 Rolex’s Oyster Perpetual Date model is something of an oddity. Obviously part of the Datejust family, it loses half its name due to its slight reduction in size (from the 36mm that has long been the Datejust standard) and the fact that it was never made available in quite the same bewildering number of bezel, dial and metal combinations. It was launched a few years after the 1945 release of its larger stable mate, in the 50s around the same time as the first of the Lady Datejusts emerged and, while more limited in choice of finish, the range was still comprehensive enough to satisfy most. 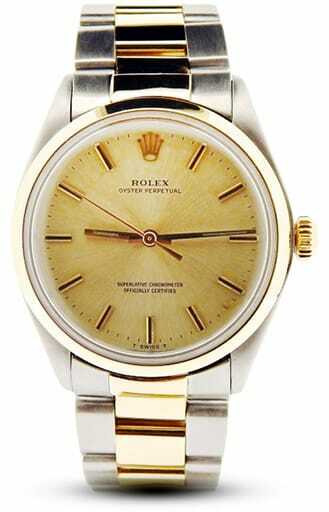 The majority of the output was produced in stainless steel, making the Date the more low-key and affordable option, but you can still find plenty of examples crafted in white or yellow gold, along with Rolesor versions. There are also several dial colors and styles as well as a selection of bezels; smooth, fluted or the much-missed engine turned surrounds that have died off in recent times. It is a watch that is still very much alive and well in the current catalog, and it has been given a slightly bulkier case in its latest iteration, making it appear just that little bit larger. But, as is the way with watch sizes, the modern Date is aimed as much at a female audience as it is at men. Commonly known as the entry-level Rolex, the Oyster Perpetual is the oldest, longest-running series in the brand’s history. The epitome of three-hand simplicity and elegance, it is as straightforward as it is possible for a mechanical timepiece to be. That name, which forms the backbone of every model in Rolex’s arsenal, is perhaps the most important in modern watchmaking. Breaking it down, ‘Oyster’ refers to the waterproof housing developed by the company in the 1920s, an innovation that took the wristwatch beyond its long-held place on the arms of aristocratic ladies and gave it a more masculine purpose. And ‘Perpetual’ is the name given to the self-winding mechanism Rolex perfected in the 30s—a vital revolution that did more than anything else to seal the fate of the pocket watch. Over the subsequent decades, the Oyster Perpetual has diversified into the specific models we are familiar with today, but has also remained as a range of its own. They have seen and been a part of some of the most important achievements of human endeavor; they have broken land speed records on the wrist of Sir Malcolm Campbell and been to the ceiling of the world with Hillary and Tensing. Like the Date, they are some of the least showy pieces in the book. You will find gold versions, but they are far outnumbered by the utilitarian stainless steel examples. While the Oyster Perpetual often acts as the gateway into the world of Rolex collecting, they are just as likely to be bought by those searching for the one good watch that will last a lifetime and be passed down to future generations. For many years, it stayed the perfect dress watch size of 34mm, but has now gone the way of the rest of the company’s offerings—the modern lineup is available in four sizes ranging from 31mm to 39mm. When it made its first appearance in 1945, the 34mm Air-King was considered an enormous beast of a watch. It formed part of a series of ‘Air’ models Rolex created as a tribute to the bravery of British RAF pilots during WWII, along with the Air Tiger, Air Lion and Air Giant. The extra millimeters made it easier for the aviators to read the dials in combat situations, and were a vast improvement on the 30mm models which were standard government issue at the time. While the others in the range were quietly retired over the years, the Air-King has endured to the present day, with only a two-year layoff for some well deserved R&R between 2014 and 2016. Until its most recent reworking, the Air-King has stayed true to its 34mm roots, with a very short-lived foray into 35mm territory in the late 50s when the Air-King Date came and went without much fanfare. In total there have been six references of the ‘Warrior’s Watch’, with the ref. 5500 from 1957 enjoying by far the longest uninterrupted run. With a modest choice of dials (the Explorer-esque 3/6/9 version one of the most sought-after) and just two caliber changes, it stayed in production virtually unaltered for an incredible 37 years. Today, the Air-King and its humble dimensions and timeless lines is enjoying its role of cult favorite. With not even a date function to muddy up the design, it remains one of the most versatile and affordable vintage buys you could hope to find. Built as a testament to the heroic few, it has a story and character that is hard to match.